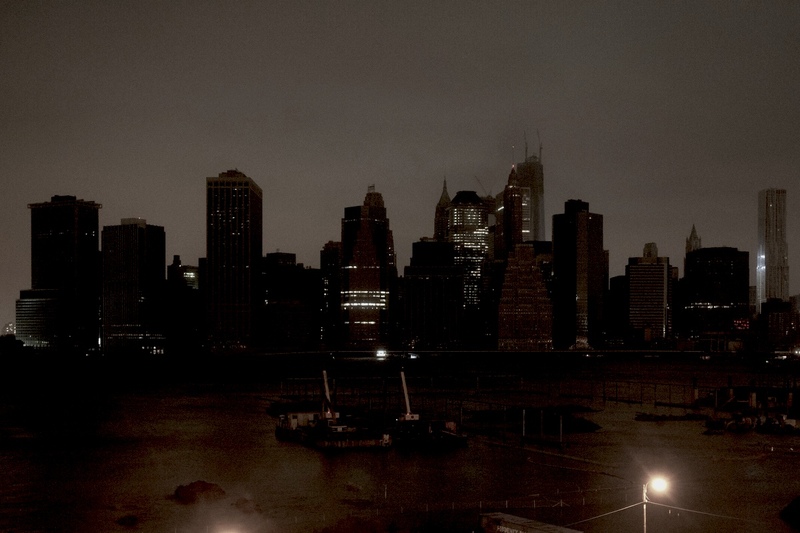 Wonder of the Week: Sandy & cost-effective cities? 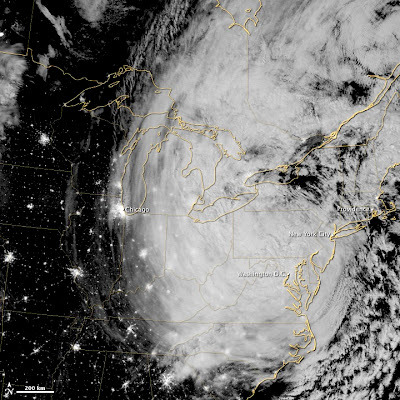 Sandy at night; 3:35 am EDT, October 30, 2012. Cities west of the storm twinkle in the dark. Top of cloud layer is illuminated by the full moon. NASA Earth Observatory photo. Even the public library way out west in Laramie, Wyoming, felt the effects of Superstorm Sandy. Sandy hit the day after I finished the Scientific American special issue on cities (September 2011). By 2008, over half the world’s population was urban (82% of the 2009 US population), and this is expected to climb to two-thirds by 2050. Does this mean more poverty, pollution, disease and crime? Not necessarily. Cities are becoming increasingly profitable, healthy and safe places to live. For example, urban residents are more likely to find work (especially women), and are less likely to die in car crashes. They require less investment in infrastructure per capita than those in suburban and rural areas, have smaller carbon footprints, and use fewer resources in general. As countries become more developed, their cities become increasingly efficient and cost-effective. But did the authors factor in the extreme vulnerability of densely-populated areas to natural disasters? Did they consider the huge costs of recovery? “We have seen a brighter future, and it is urban.” Scientific American, September 2011. Photo of a not-so-bright New York City from The Baltimore Sun. 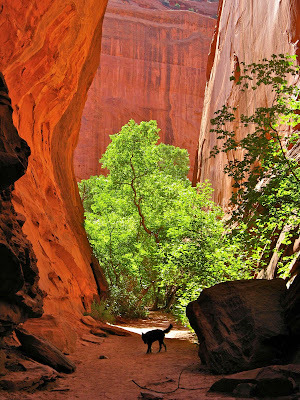 Even when things are not so wonderful, I can rely on Nature to provide both types of wonder -- awe and curiosity, among the finest of human emotions. 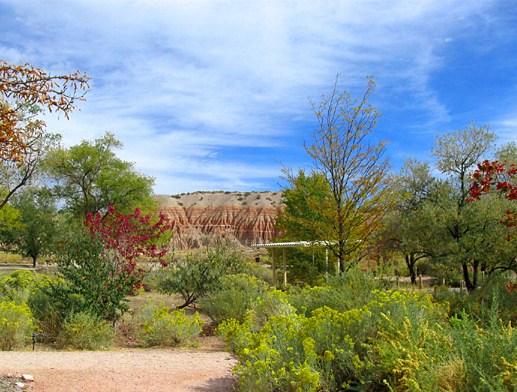 Cathedral Gorge State Park campground (photo source). 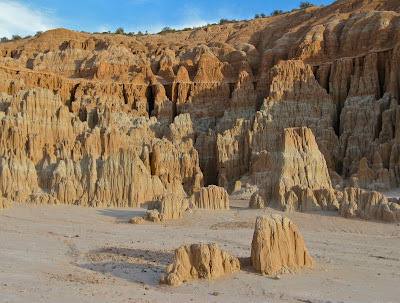 On a hot Nevada afternoon back in September, I happily collapsed in the shade of a campsite at Cathedral Gorge State Park in Meadow Valley just north of Panaca. After a refreshing siesta, I set out on a tour of the bottom of a lake. 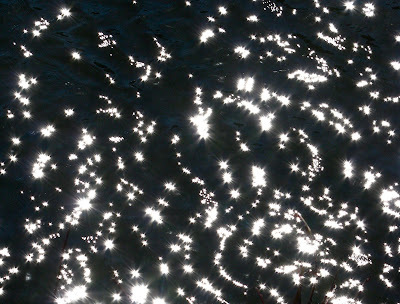 View of a lake bottom, through "geologically enlightened eyes." Only 5 Ma (million years ago), just a moment geologically-speaking, this was a much cooler wetter place. 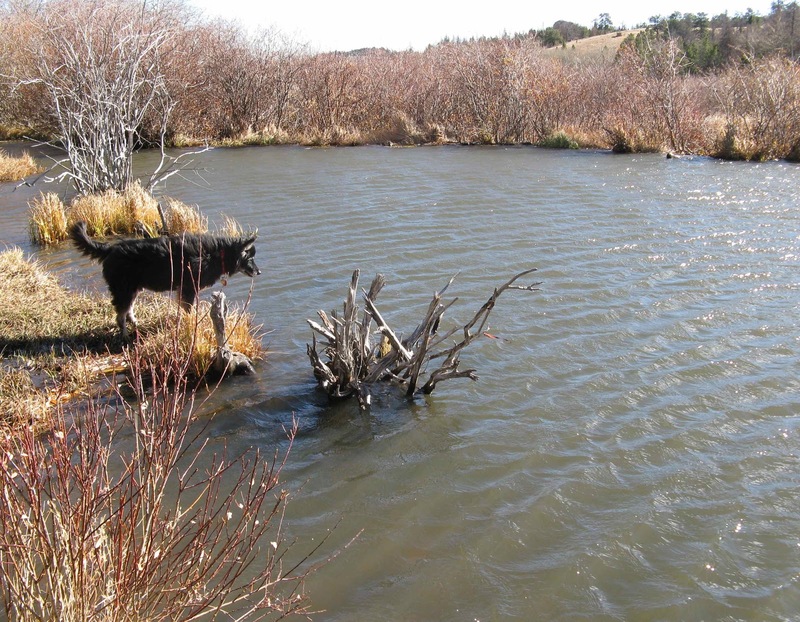 Meadow Valley was a closed drainage basin with a lake in the bottom. Water flowed in but not out, and creeks and runoff carried in gravel, sand, silt, clay, gunk and dead animals. Some 1400 feet of sediments accumulated, enough to provide spectacular scenery for modern-day visitors. 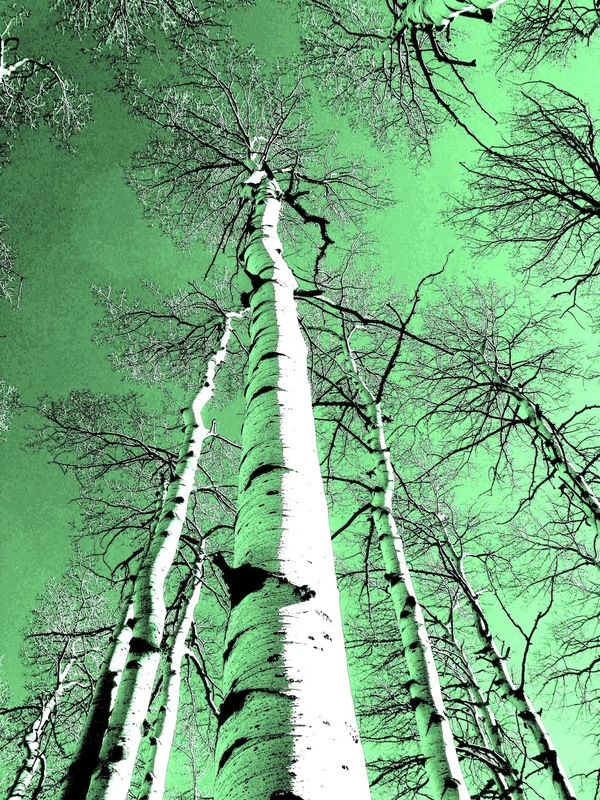 It’s tempting to view landscapes as static. There’s an earthquake every now and then, or a landslide here and there, but generally we see little change over the course of our lives. But at the scale of the Earth’s life, its surface is anything but static. The huge plates that make up the crust are constantly jostling, colliding, shoving, diving, splitting and even stretching. 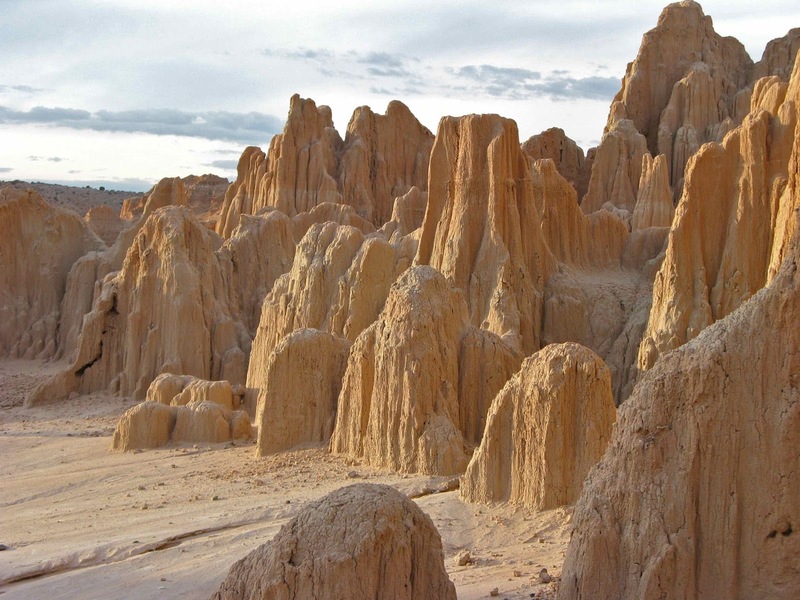 It was expansion of the Great Basin that created Meadow Valley, along with the other valleys and mountains of the Basin and Range Province. 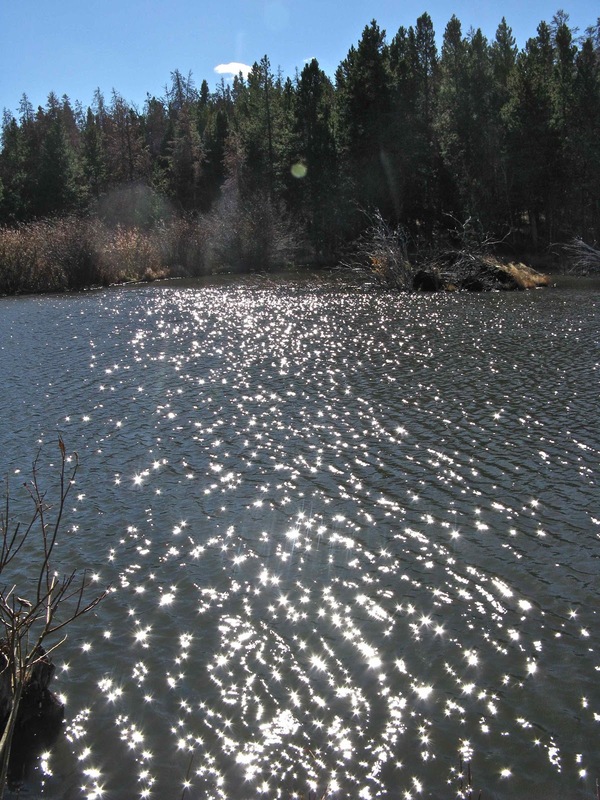 At some point, maybe as recently as the late Pleistocene (only 100,000 years ago or so), the region was tilted, “spilling” the lake down Meadow Valley Wash. Erosion went to work on the exposed lake bed, carving out badlands and sending sediments down the wash, on the move once again. Badlands -- "heavily eroded, uncultivable land with little vegetation" (Oxford American Dictionaries). 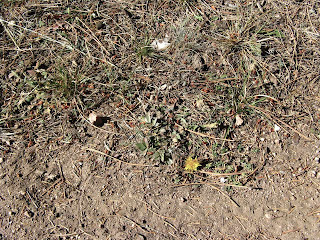 Yup, these look to be badlands alright, can't grow much here! Not all lacustrine (lake) deposits are eroded into such striking and curious forms, so there must be something special about these sediments. 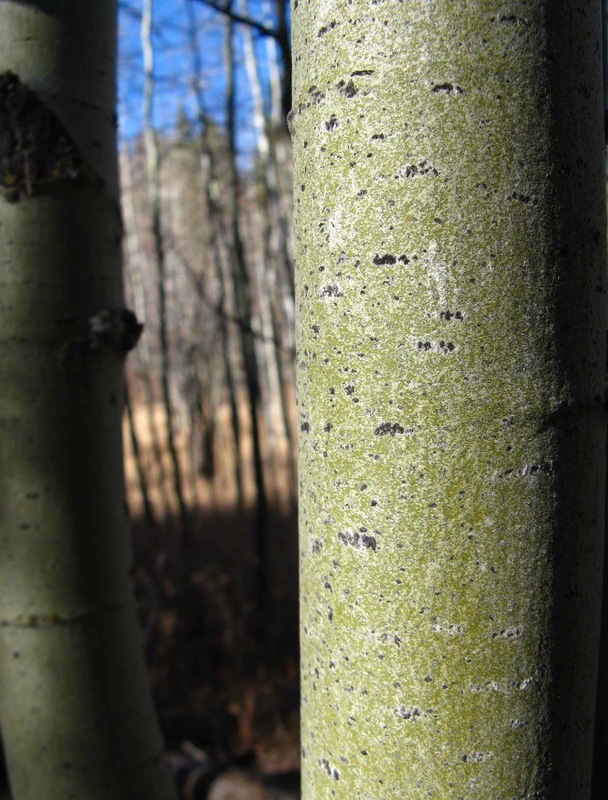 They started out as volcanic ash, produced in huge explosive eruptions during the incredible volcanic mayhem of the Great Basin in mid-Tertiary time, roughly 40 to 20 Ma. This was a hell of a place, quite literally. Flows of red-hot ash raced across the landscape, incinerating everything along the way. Wind-borne ash clouds obscured all sunlight. Incandescent flows glowing in constant darkness must have been terrifying! Ash in the flows was so hot that it fused to form welded tuff or ignimbrite (from Latin for fire-shower). 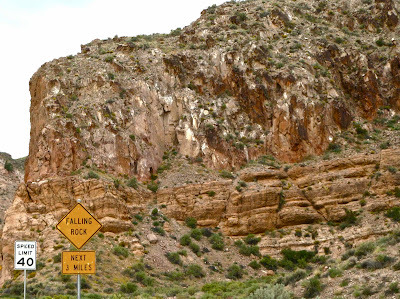 The remains of the catastrophic eruptions -- extensive outcrops of welded tuff -- are common in the Great Basin. So much magma was removed from these violent volcanoes that they collapsed and formed calderas -- monstrous depressions miles across. 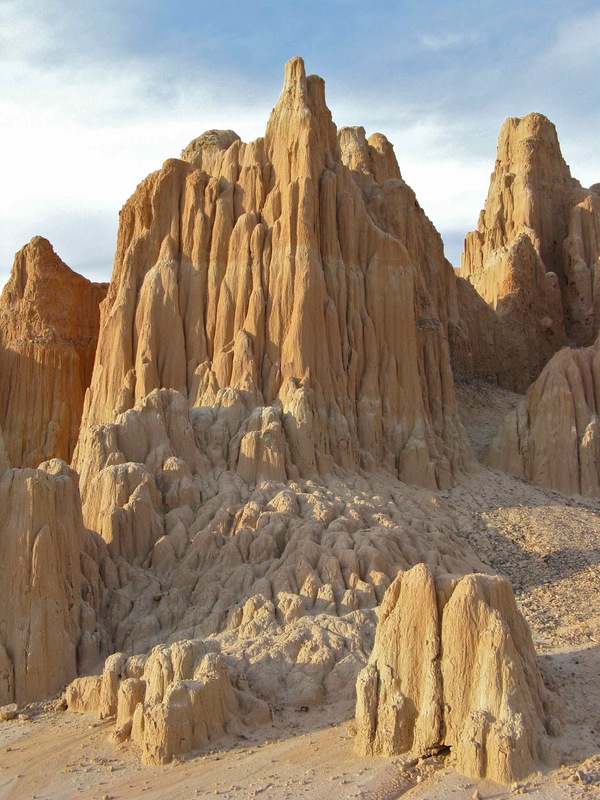 Just a short distance south of Cathedral Gorge is the huge Caliente Caldera complex, about 20 miles across north to south, and 50 miles east to west. It produced vast amounts of ash and welded tuff over its 9-million-year lifetime, including some that ended up in the Cathedral Gorge badlands. Major mid-Tertiary calderas; based on DeCourten 2003, Taylor and Switzer 2001. The old eruptions still cause problems -- welded tuff south of Caliente tends to fall on the highway. 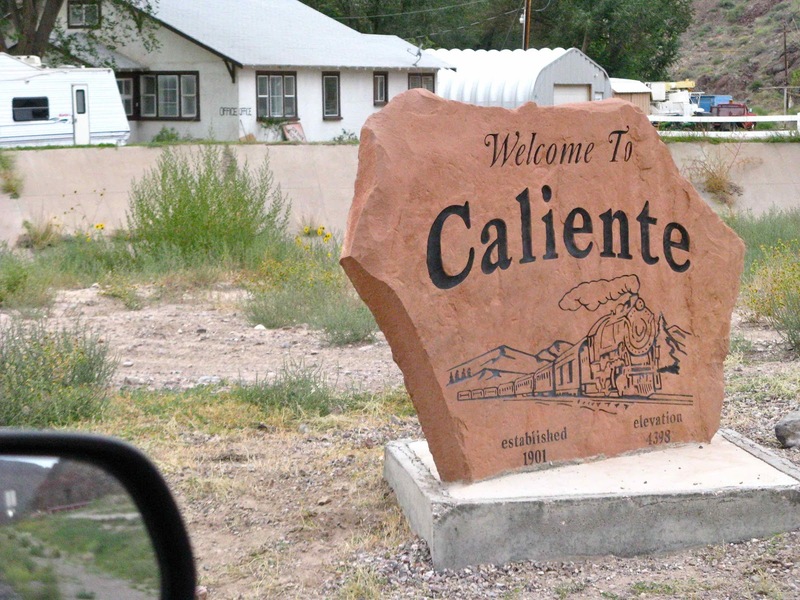 Caliente may be a sleepy little town now, but it was a happening place 20 million years ago! Rock is ephemeral, of course, and weathering and erosion went to work reducing the Caliente welded tuffs to silt and clay. Some of this accumulated in the bottom of the lake in Meadow Valley, eventually producing 1400 feet of rock, much of it poorly-cemented, easily-eroded, clay-rich and sticky when wet. This is the Panaca Formation, famous for its abundant small mammal fossils, and named for the town of Panaca, famous for its annual dutch oven cook-offs. 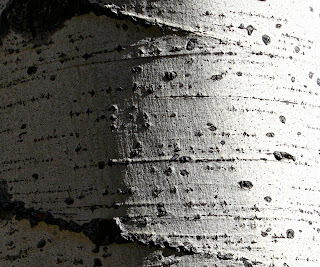 Not all Panaca strata are soft. 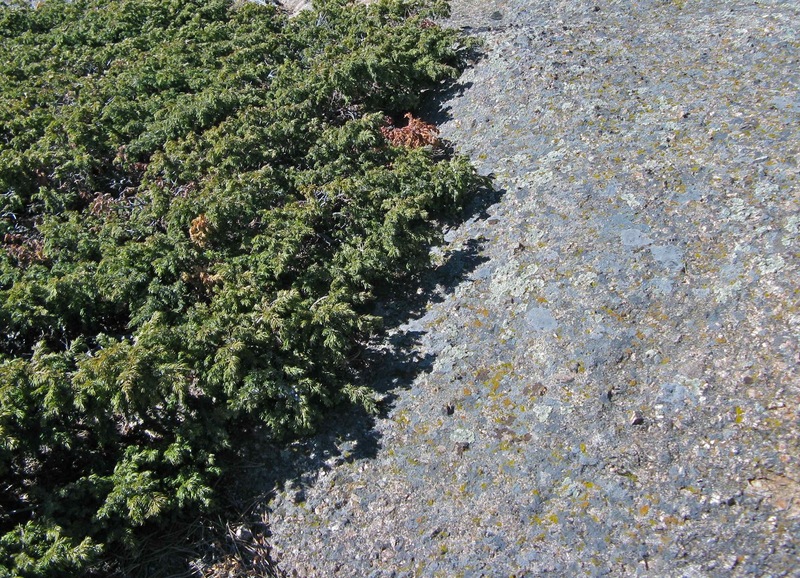 There are thin beds of resistant limestone that form "caps" protecting softer rocks from erosion. It's because of these caps that the Panaca is sculpted into fanciful castles and hoodoos, and tall narrow “caves”. 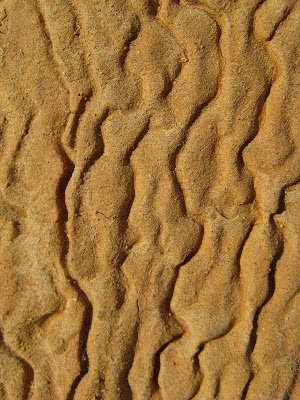 Panaca Formation, with thin layers of freshwater limestone on top of softer strata. Narrow gullies with tall, nearly-vertical walls (two visible on left) are called "caves". 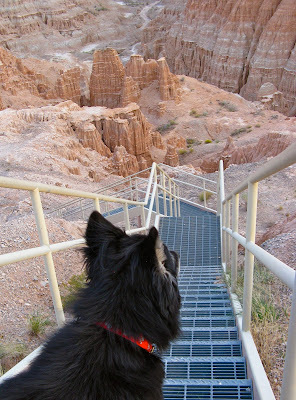 The big hoodoo on the right is the most famous one in the park, note book cover below. Trails of water rivulets -- marks of the sculptor's hand. Sculptures are short-lived. 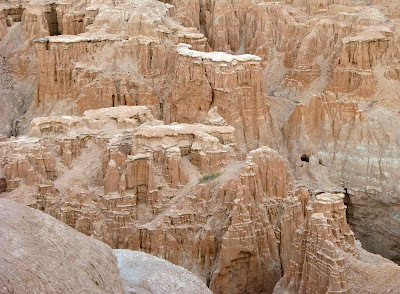 Remnants of old scenery form low piles below today’s badlands. 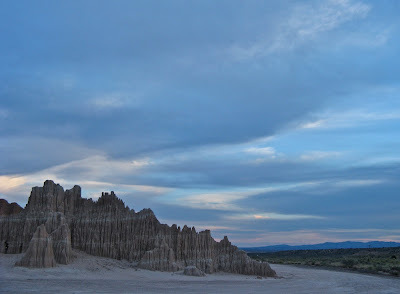 Just think ... this crumbling rock once was searing volcanic ash that raced across the landscape burning everything in its path, and then was welded into tuff, weathered and eroded, deposited in a lake, exposed when the lake was emptied, and sculpted into badlands. What a great story! 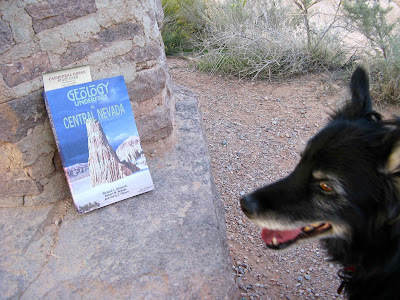 It's so wonderful that we can decipher something of the geological history. 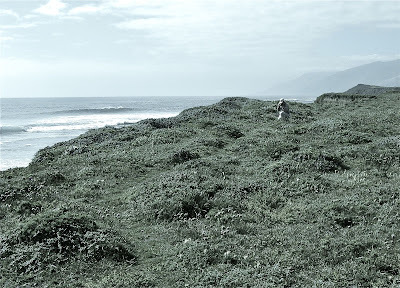 For me, it makes these beautiful landscapes even more fascinating. 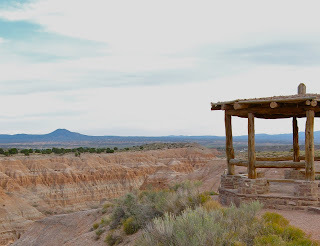 Miller Point Overlook, with views of Cathedral Gorge and the Great Basin beyond. 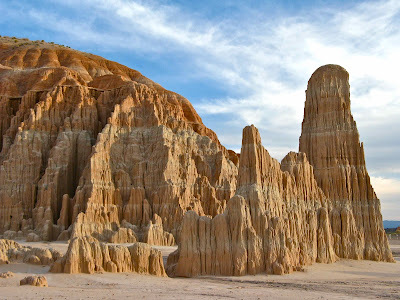 Cathedral Gorge State Park is located in southern Nevada, just off US Highway 93 about 10 miles south of Pioche, 25 miles north of Caliente, and just a few miles north of Panaca. It is roughly 175 miles from Las Vegas via I-15 and US 93. The campground features showers and shady sites, and there is a small system of hiking trails -- the longest loop is 4 miles. 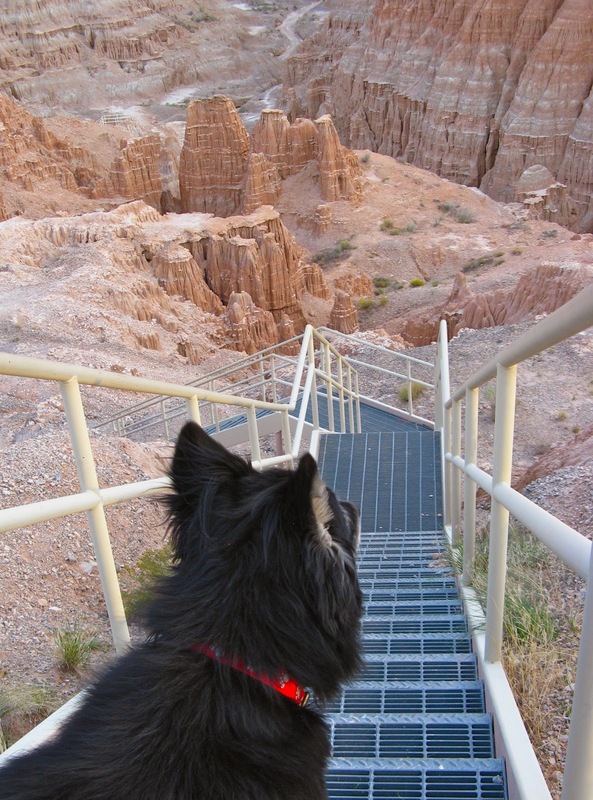 A scenic and fairly easy trail goes from the picnic area up a drainage through beautiful badlands to the Miller Point Overlook. Stairs make the final ascent through soft Panaca “rocks” possible. 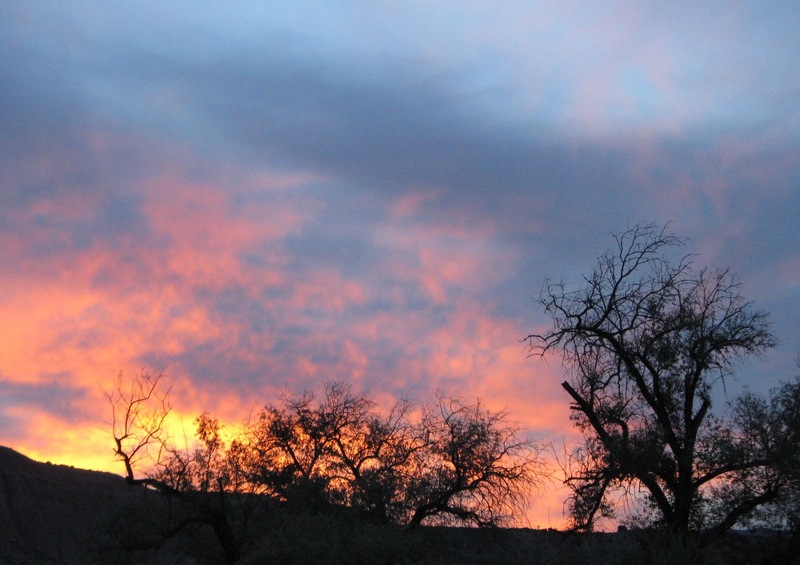 ... and watch the sun set, with an appropriately fiery display! DeCourten, F.L. 2003. The Broken Land; adventures in Great Basin geology. Salt Lake City: University of Utah Press. Orndorff, R.L., Wieder, R.W. and Filkorn, H.F. 2001. 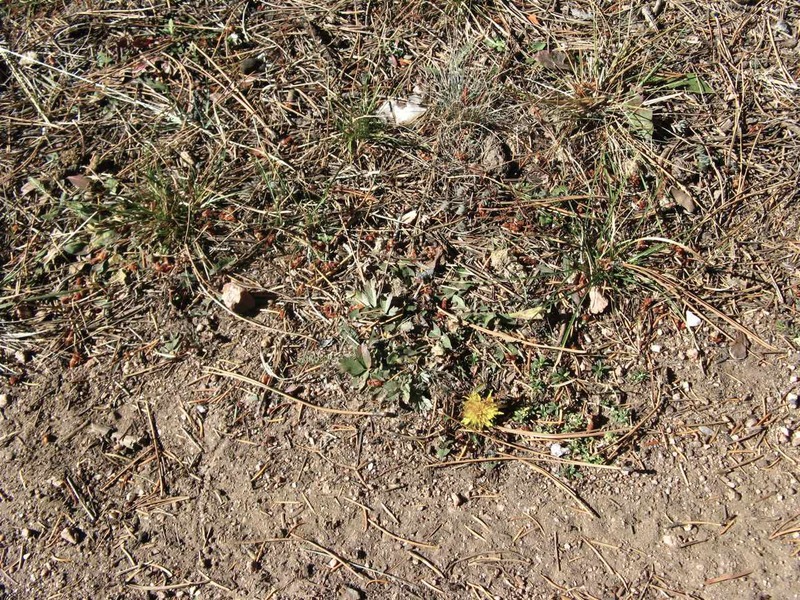 Geology underfoot in central Nevada. 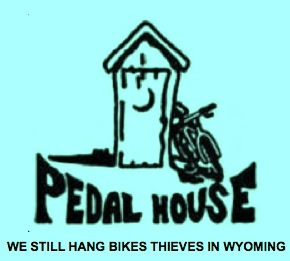 Missoula, MT: Mountain Press Publishing Co. 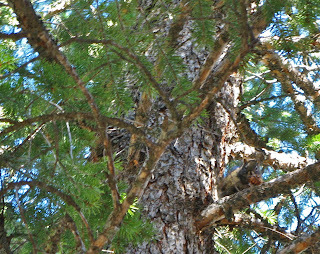 Looking for Detachment posted about Cathedral Gorge State Park here and here. Lindsay, E. et al. 2002. 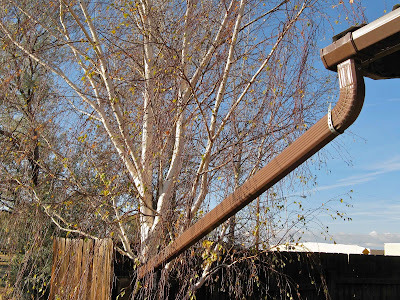 Recognition of the Hemphillian/Blancan boundary in Nevada. J. Vert. Paleont. 22:429-442. Pederson, J. L. et al. 2000. Neogene through Quaternary hillslope records, basin sedimentation, and landscape evolution of southeastern Nevada. GSA Field Guide 2 pp 117-134. Scott, R.B. et al. 1996. 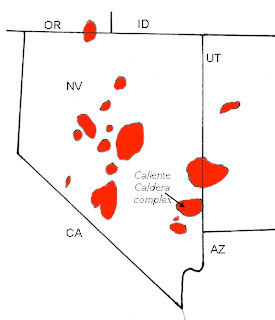 Synchronous Oligocene and Miocene extension and magmatism in the vicinity of caldera complexes in southeastern Nevada. Denver: CO Geol. Surv. Open-File Rep. 96-4, Field Trip No. 7. Taylor, W.J. and Switzer, D.D. 2001. Temporal changes in fault strike (to 90º) and extension directions during multiple episodes of extension: An example from eastern Nevada. GSA Bulletin 113 pp 743–759. 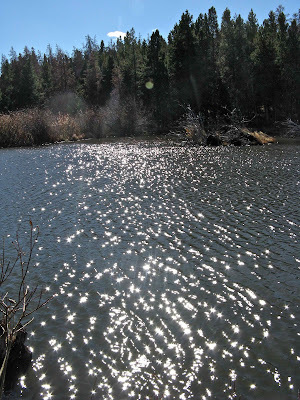 ... it's a beaver pond, sparkling in the autumn light. 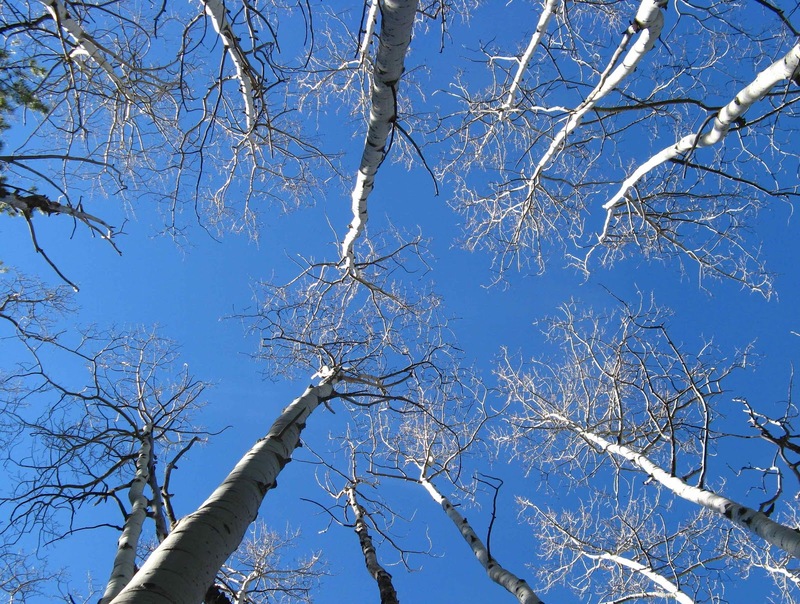 Tuesday morning, the National Weather Service warned that it was the last day of Indian Summer, and advised that work be set aside for one last trek in the Laramie Mountains. First stop was Pole Creek. 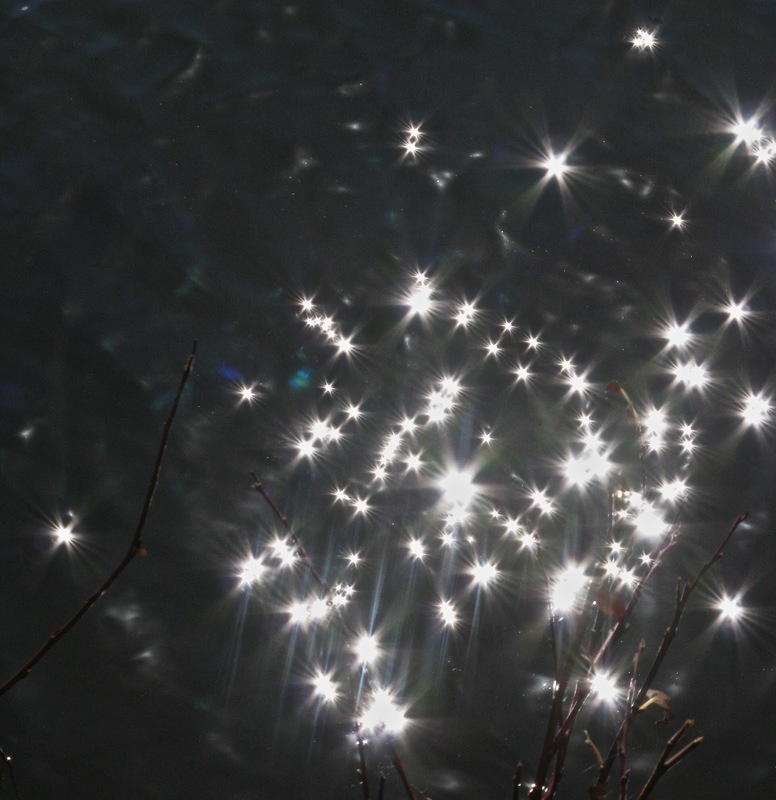 Experimenting with my point-and-shoot, I discovered that fast shutter speeds could capture sparkles dancing in the wind on a night-black surface. It was fun playing with wind, water and sunlight! 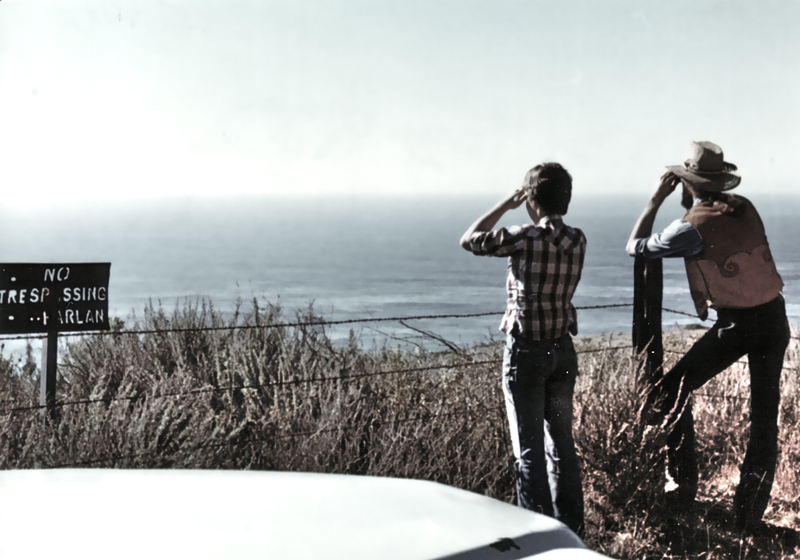 I could have spent a lot of time there, but we had miles to go. 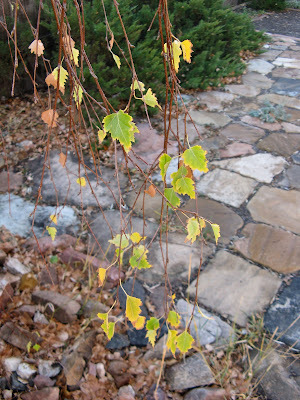 There wasn’t a leaf left on the quaking aspen, fall color was gone. 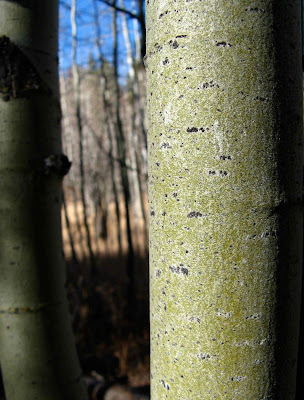 Landscapes were gray, brown, blue, white and coniferous green. 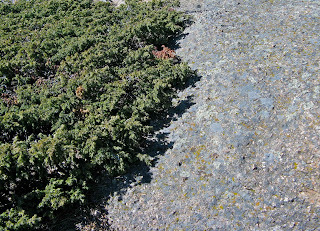 Common juniper and Sherman granite. 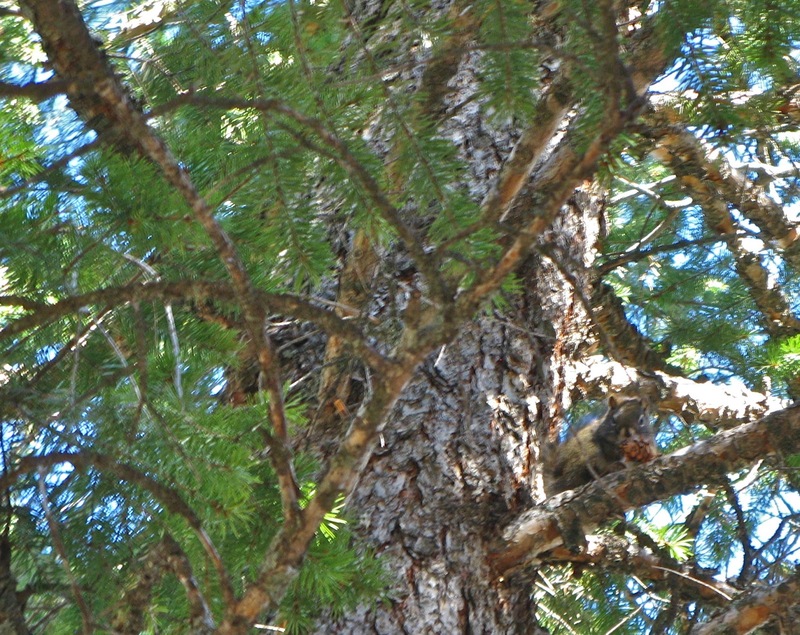 Red squirrel working on a lodgepole pine cone. Then suddenly, a flash of yellow! 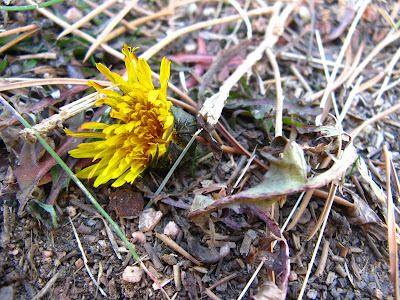 It was a lone dandelion along the trail. I like dandelions, often the first and last blooms of the year. 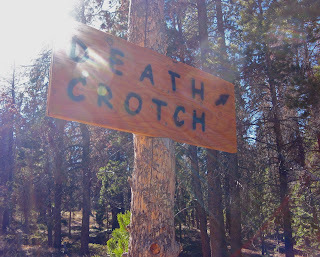 We reached the Death Crotch Trail. Ominous? 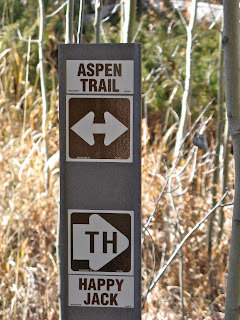 maybe for mountain bikes, but it’s a great hike, only moderately strenuous. 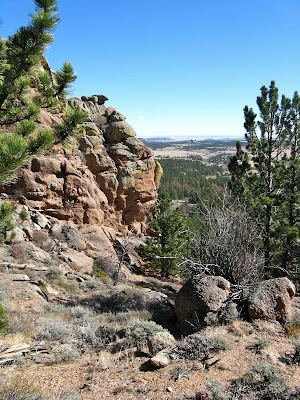 In less than a mile we were at the crest of the Laramie Mountains, with distant views east. It was blowing so hard that it was difficult to stand still and take photos. 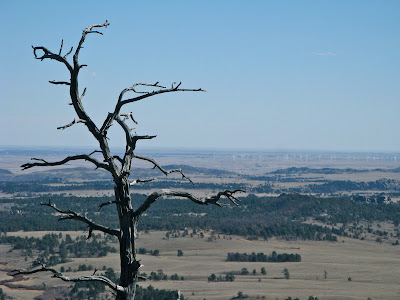 Great Plains in the distance, with wind farm (right of the dead tree, click to view). Do we really need to farm wind in Wyoming?! 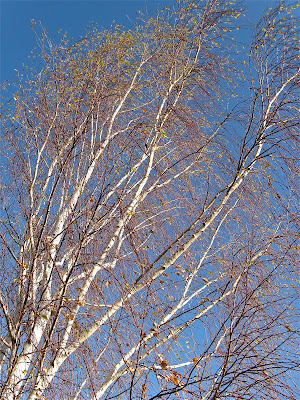 Here there was no wind, in fact no sound at all except for dead leaves crunching underfoot. 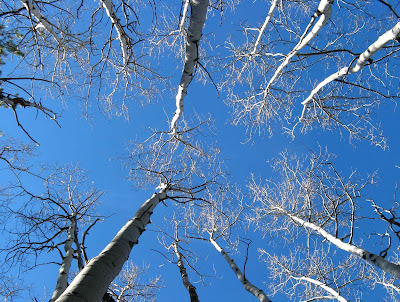 The aspen were bare, but still it was an enchanting place to be, as always (you can see the Enchanted Forest in its fall finery here). A short break, a snack, a few more photos -- then it was time to go. It was only 3 pm, but already getting cold. Winter’s not far off! The Happy Jack trails tour the crest of the Laramie Mountains in southeast Wyoming, just north of Interstate 80 only 12 miles east of Laramie and about 35 miles west of Cheyenne. Weekends are busy, but use is surprisingly light during the week. 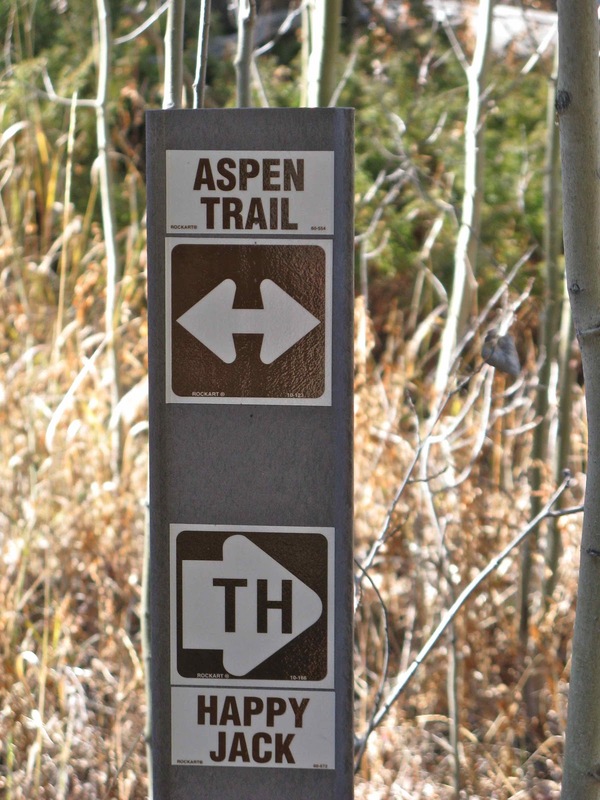 Trails are open to hikers, bikers, horses and dogs. The area is managed by Medicine Bow National Forest (parking fees at some trailheads), but the best maps are available from the Pedal House in Laramie. Franciscan Complex up close, near San Simeon, California. 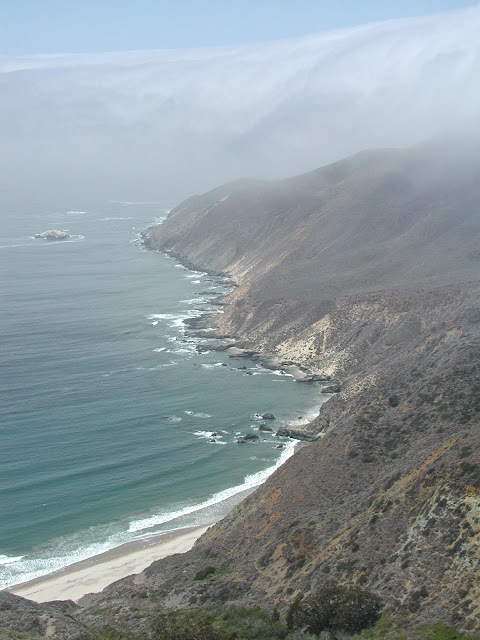 I’m from California's Central Coast, home to the Franciscan Complex. It’s a good thing I waited until I moved to Wyoming to learn about geology, otherwise I would have been totally turned off! 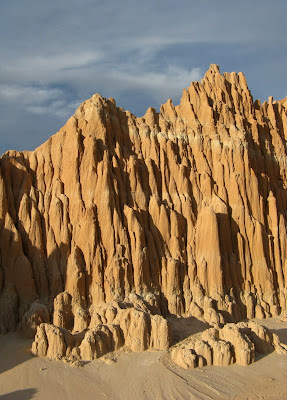 “The whole point of geology is to make sense of the rocks ... 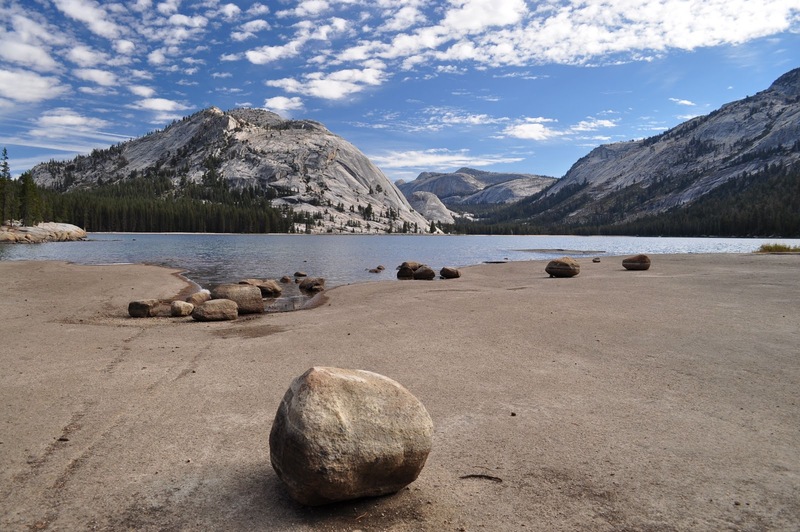 If all rocks resembled the Franciscan complex, no science of bedrock geology would have emerged.” (David Alt and Donald Hyndman in Roadside Geology of Northern and Central California, Mountain Press Publ. Co., 2000). I’ve contemplated writing a post about the craziness of the geology there, the chaos that occurred as the North American Plate overran the Farallon Plate, and that continues today as the Pacific Plate bumps and grinds against the North American. The resulting scenery certainly is fantastic! But I always end up intimidated. 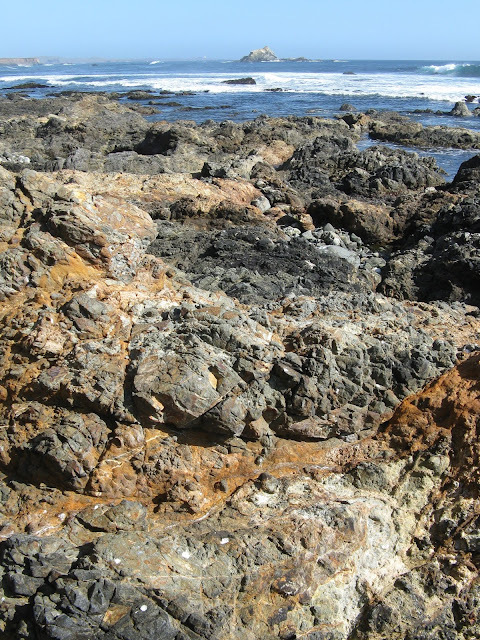 The story is just too complex -- multiple accretionary events, goo scraped off subducting seafloors, blueschist, eclogite, serpentinite, mantle rocks now at the surface, major shifts in the dance of the plates, repeating ophiolitic suites of shale, chert, pillow basalt, peridotite and gabbro, and of course the infamous Franciscan mélange -- all deformed again and again. 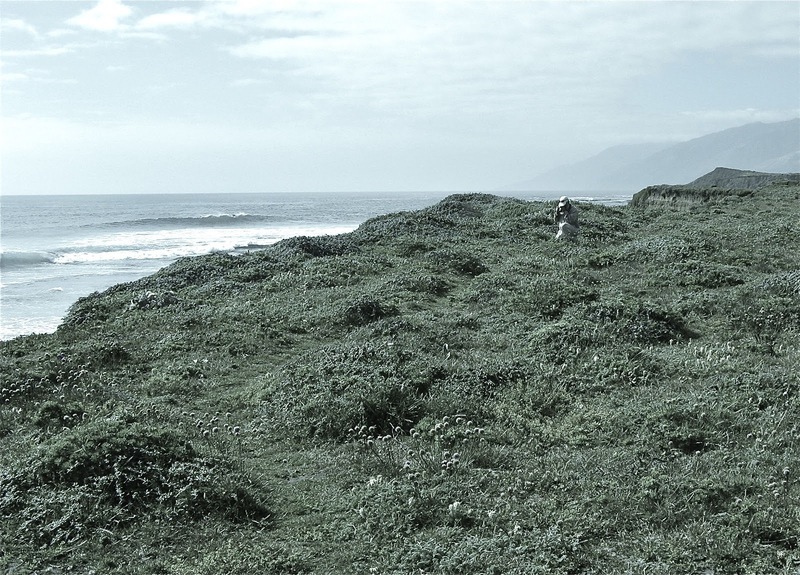 Perhaps this inexplicable mess is better suited to awe and wonder, poetry and photographs. 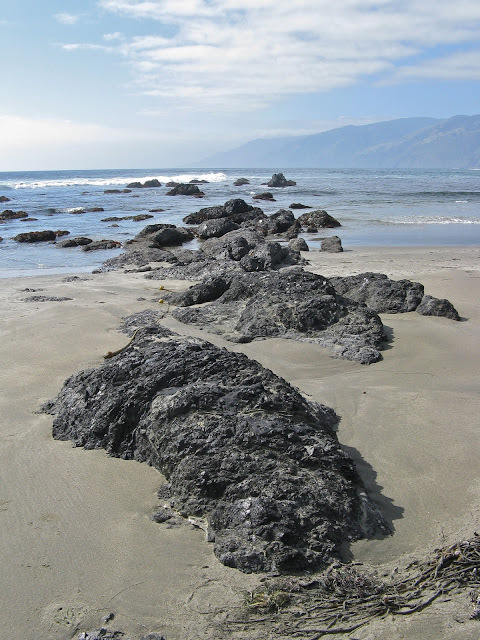 Point Sal, home to the Coast Range ophiolite. 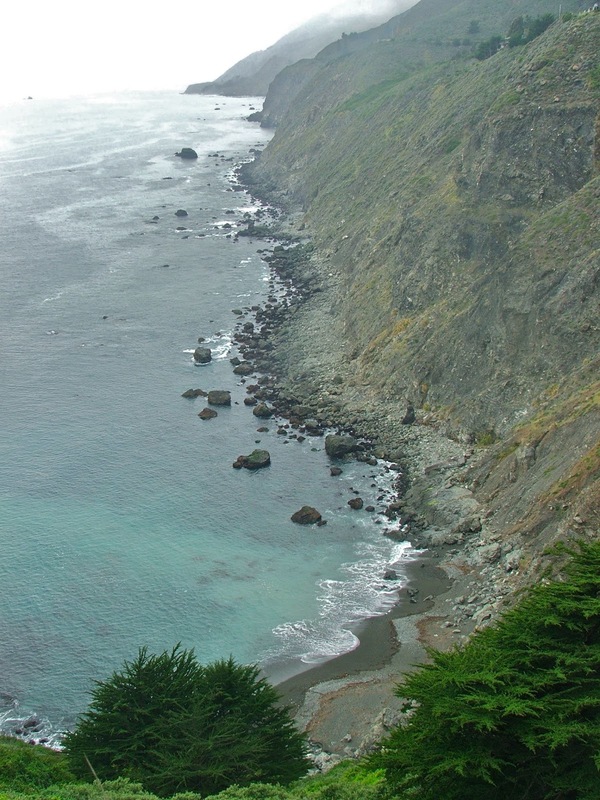 The Big Sur Coast, a coast of dreams. Photo by Ronn Koeppel. Searching for enlightenment at Big Sur, in the day. 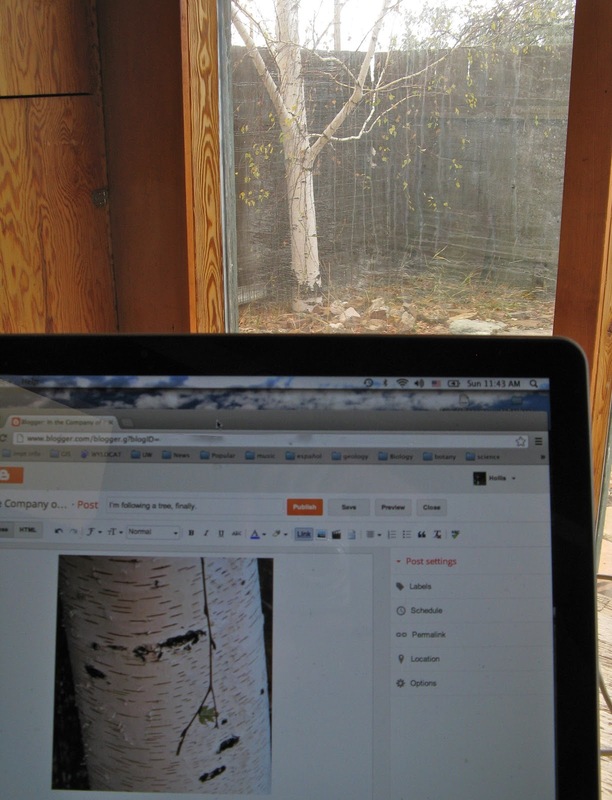 GeoPoetry is the topic for this month’s Accretionary Wedge, hosted by Matt Herod at Geosphere. No ... I wasn’t there, unfortunately. Photo courtesy Ronn Koeppel, who was. I have yet to meet a mountain range as beautiful as the Sierra Nevada of California, with its vast expanses of pale granitic rock, often polished smooth by glaciers. It's one of the largest batholiths in the world -- 60 miles wide, almost 400 miles long, and composed of an unknown number of individual plutons, probably hundreds. These igneous bodies formed far beneath the surface, but when the Sierra Nevada was uplifted, erosion went to work to expose the gorgeous mass of rock for all to enjoy. 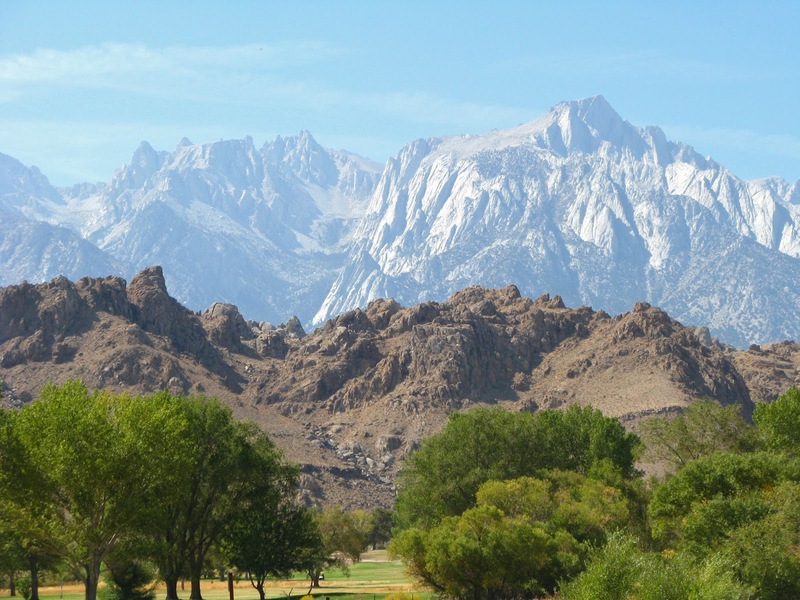 The east face of the Sierra Nevada stands high above the Alabama Hills, near Lone Pine, California. 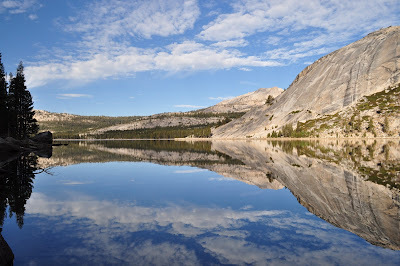 It has been a long time since I was last in the Sierra Nevada, though I’ve come close enough recently to be awestruck by its remarkable landscapes. A trip into the Range of Light is high on my list of Dreams. 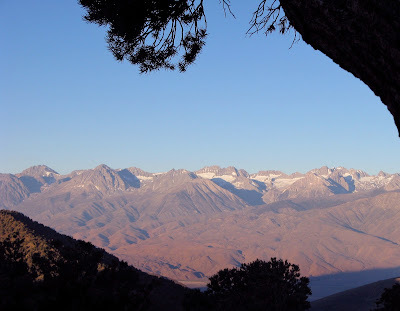 High peaks of the Sierra Nevada in early morning light; view from the crest of the White Mountains. 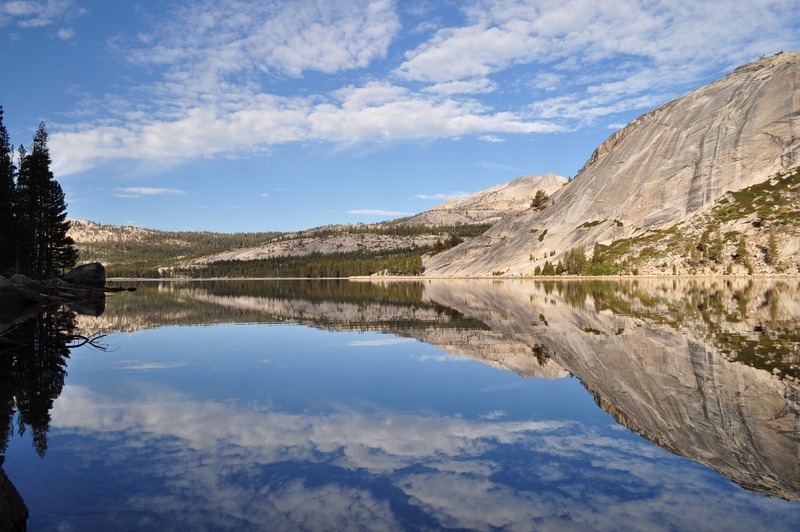 Celestial scenery of the Yosemite high country. Photo by Ronn Koeppel. Some months ago I claimed to be a Tree Follower, joining a group of like-minded folk organized by Lucy at Loose and Leafy. So it’s about time I got on with it. 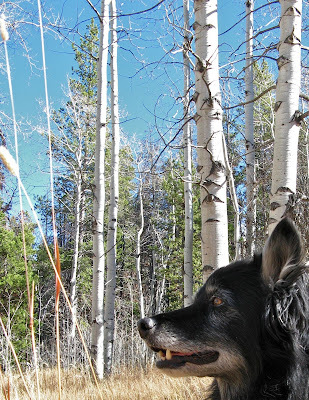 The idea is not to chase after a tree, obviously not necessary, but rather to visit a specific tree occasionally to see what’s going on in its life -- to be an “interested neighbor” as Lucy says. I asked: What tree is most interesting to me? Which one do I most like? 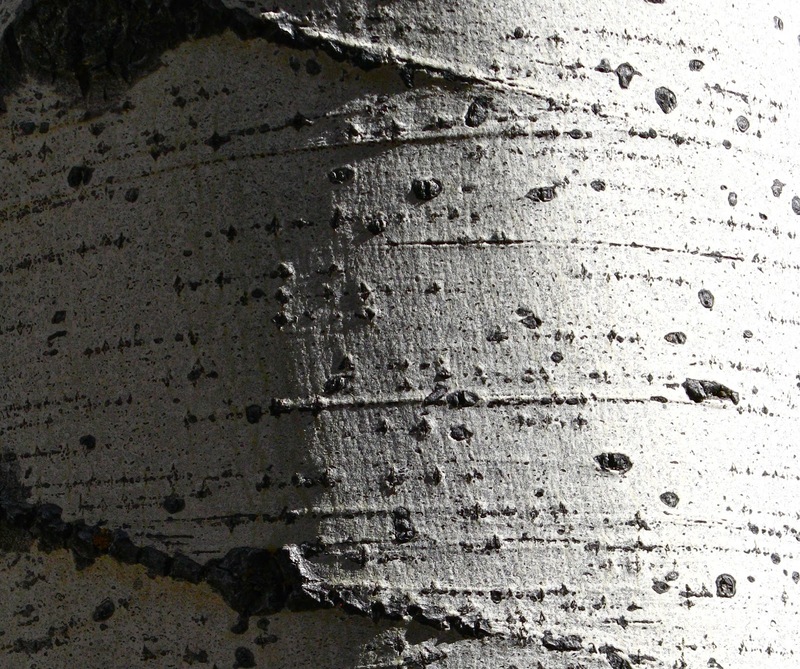 Answer: this tree. Should be easy to follow as it grows right next to my house. I’m introducing my tree mid-autumn -- not exactly its finest moment. What leaves are left are tattered and dull yellow-green, though they still look pretty in the morning sunshine. 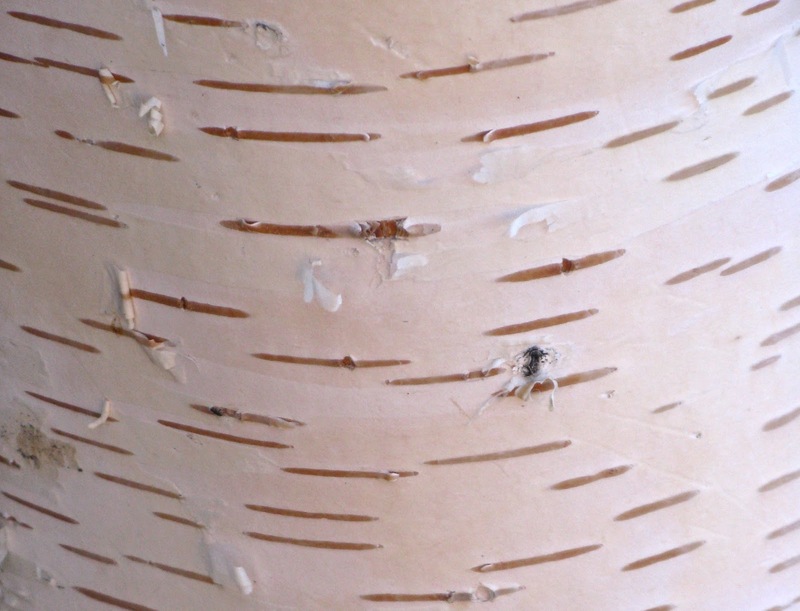 The bark is white, with horizontal linear lenticels (brown lines above). 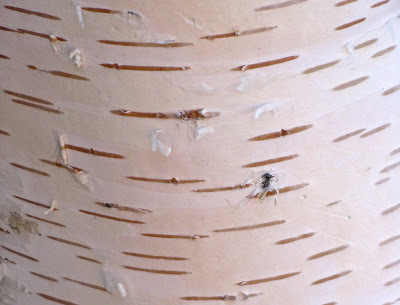 Weeping birch bark doesn’t peel nearly as much as that of paper birch -- just a tiny bit. 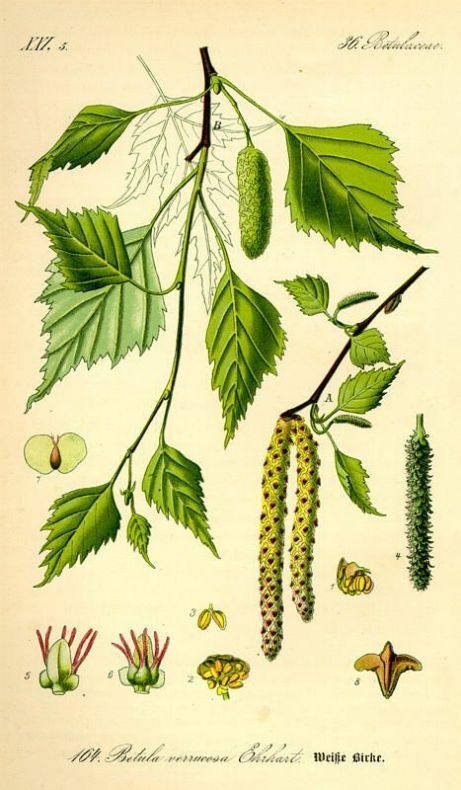 Betula pendula is native to Europe and Asia. It’s a popular landscaping tree in North America, and has escaped and become naturalized in some areas, especially in the Northeast. Illustration from Otto Wilhelm Thomé: Flora von Deutschland, Österreich und der Schweiz (1885). 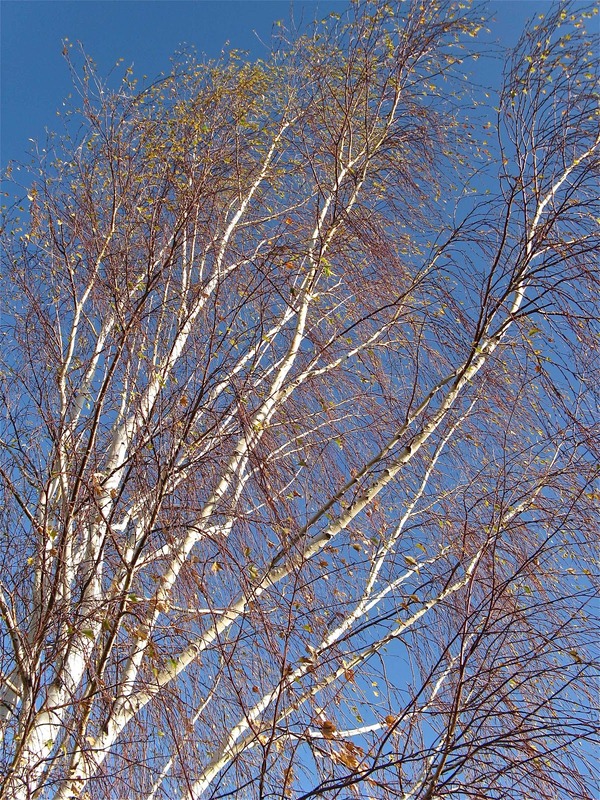 My weeping birch grows at 7000 feet elevation, where it's nice and cool. 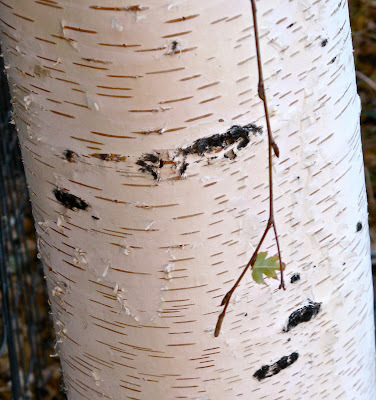 But precipitation is only 11 inches per year, far too little for a birch tree. Here’s the solution -- rainwater and snowmelt run off the corrugated metal roof of the house into a gutter, and then down to the weeping birch. 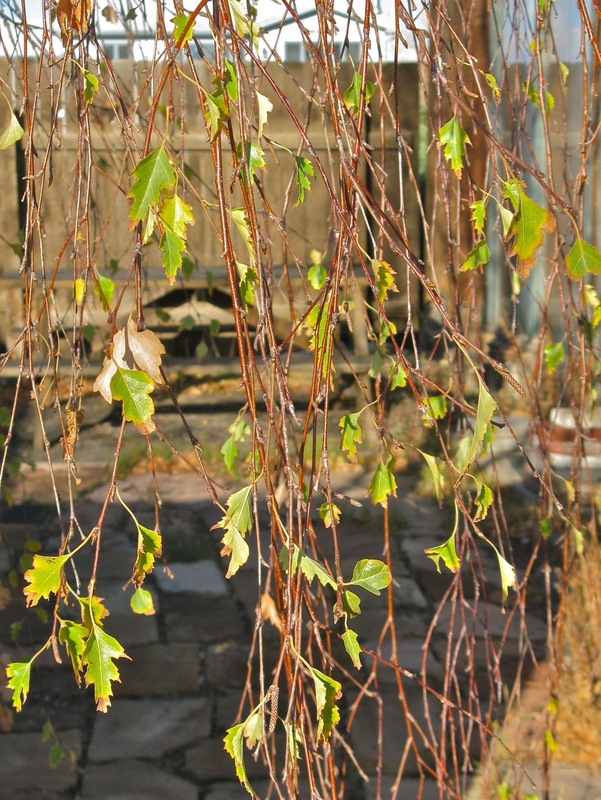 Usually this is enough to keep it happy and green through summer. 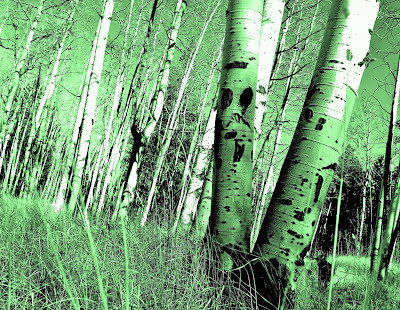 Are you following a tree? Want to give it a try? For details, check out Lucy's WHAT IS TREE FOLLOWING?. Sparky wants to follow this beautiful boxelder in Long Canyon in southern Utah.